FrogPad | You don't need a QWERTY keyboard anymore. Convert your QWERTY keyboard for your laptop, and transform 15 keys into a left or right-handed FrogPad™. This should hold you over until the NEW FrogPad2™ with Bluetooth® is available in Spring, 2014. All the functions of your standard keyboard remain the same, you will just use the Frog method to type. 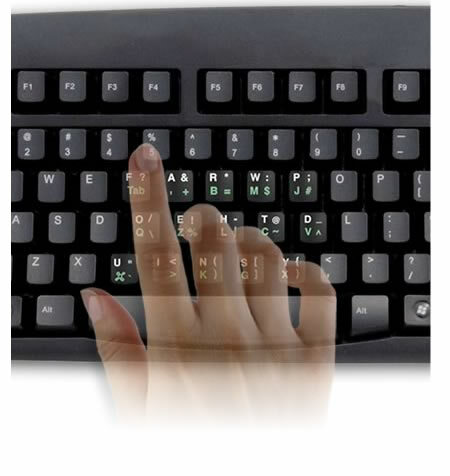 Software for PC and 3 sets of removable clings for your QWERTY keyboard. Convert your QWERTY keyboard into a Lefty or a Righty keyboard. Coming 2014 - QFrog for Mac! Why type with two hands when you could type with one? Tell us what you do with your other hand! Click below and enter your email address to reserve your FrogPad2! Connect with us for updates, specials, and new releases.